Distinctive features Morningstar has beautiful features and an athletic build. Even as a young child, Darla was interested in becoming a police officer to continue the family tradition. She studied law enforcement in college and graduated at the top of her class. As an officer in Los Angeles, she became involved with fellow officer Allen Farmer. On a case involving stolen chemicals, Marston and Farmer were ambushed by the thieves and doused with the chemicals, which granted them both megapowers (Farmer later became the villainous Ignition). Personality Darla is friendly, but serious about her career as a police officer. She has a slight crush on her teammate, Glowbeam. Morningstar can hypnotize a foe and control his actions or make him believe he sees things that are not really there. 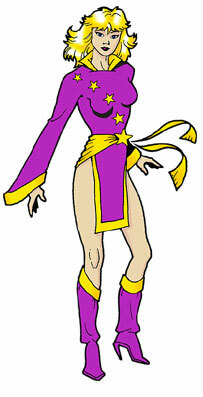 She can detect danger before it happens, and can telekinetically propel herself through the air. She can throw the star on her sash as a weapon. Skills As a trained police office, Morningstar is skilled in hand-to-hand combat and the use of firearms. She also has some gymnastics training.